All the data from input fields must be validated before being sent to a server. Data validation is implemented with DataProcessor, HTMLForm and Form as well as with all the data management components (DataTable, DataView, Tree, TreeTable, List). By means of on-the-go HTML5 validation that works for Form and HTMLForm. While the first three are features of this library and work in conjunction with validation rules, the latter is a built-in HTML5 feature. Data validation can be triggered on any event of any form element. It's possible to validate any number of controls as well as the whole form. "key" - to start validation on the onKeyPress event, when a user enters a character into the field. Note, that this method allows defining a validation event only for this control. Note that if a separate form field is validated, only its own validation rules will be considered. If any record or field fails validation, it is marked with embedded red highlighting (true for both in-library and HTML5 validation). It is also very easy to apply built-in validation messages for form fields. 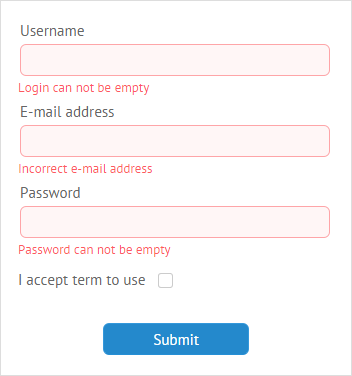 invalidMessage:"Login can not be empty"
The property is 18px by default. If the value isn't set, a space for validation messages will be automatically specified as 18px. 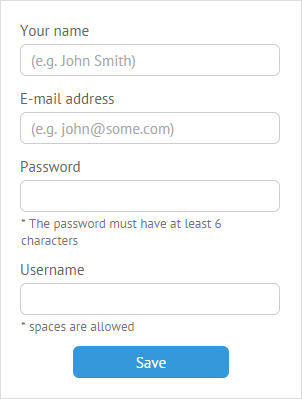 There's also a possibility to put some hints on correct filling of form fields for users. The bottomLabel property will be helpful for this purpose. Don't forget to set the bottomPadding property to specify the size of labels. onValidationError - triggers in case an error during validation happens. Message boxes of all types are described here. The validate() function checks whether data complies with certain rules defined in the rules object that contains a collection of property-rule pairs. Predefined rules are accessed through the webix.rules class. Here you attach rules to inputs by their names. Name is a read-only property that can be assigned to any input of the form/ htmlform. Here you need to define which data item you'd like to validate, namely specify its template #value# or, in case of datatable, the ID of a column. isChecked - checks whether a checkbox is checked. It is needed for JSON data to be parsed properly. Note that in case you define rules within the input constructor, the isNotEmpty rule can be substituted by the required property. A validation function must return true for success and false for failure. For example, you can define the minimum and maximum values for the form field or check whether the input data complies with a certain criterion. if you need data from several form fields for validation, use the $obj key. The rules specified by the "$all" key will be applied to each field of the form. The function is called once for the whole form. If it returns true, the form is treated as valid, and vice versa. Since the whole data object is passed into the rule, the field data can be accessed as obj.field_name. Related sample: Datatable Validation. Complex Rule. It can be as well used in defining complex rules, e.g. when password confirmation is required. Alternatively, you can ignore function parameters and work directly with form values derived with the getValues() method. Note that if the form itself is hidden, hidden and visible fields are not distinguished. The same as in the Form, rules are set within the component constructor. With validation enabled, you'll be warned about invalid data in your component on the client side, while avoiding loading wrong data to the server. As a result, you cannot add an empty record to the list data. Read more about data templates here. With the datatable component we need a column ID, since it correlates with data items. Invalid data is highlighted within the component and cannot be sent to a server (in case you work with dataprocessor). By default, with rules defined, validation starts each time we finish editing and close the editor for this or that data item. However, editing events allows validation with an editor opened. The obvious bonus of such a method is that until new data is valid, it can't be changed within the component. Related sample: Datatable. Editing Validation. ignore - the flag to indicate a user action after editing, whether they save the new data or escape the saving thus restoring the old data. For more information about text editors, go to the dedicated article. Here we speak about the client side, in-browser data validation powered by HTML5 means. In HTML5 layout input tags come in plenty of types and feature a number of attributes that define the validation pattern. Here validation is defined by the required attribute. in case of an empty field: "Please fill out this field!" url - requires the http:// prefix for validation.